Download a PDF copy of this information. Spellers compete from all 50 U.S. states, several territories and other countries including the Bahamas, Canada, Ghana, Jamaica, Japan and South Korea. For the second year, spellers invited through the RSVBee program also will compete alongside spellers from sponsored regions. o Media Avail on Wednesday to interview Paige Kimble, executive director of the Bee, Dr. Jacques Bailly, pronouncer, and Dr.
• Monday, May 27 — Preliminaries multiple-choice test in the morning. • Tuesday, May 28 — Onstage spelling all day for Round Two and the start of Round Three (Group One only). • Wednesday, May 29 — Onstage spelling all day for the remainder of Round Three. Fans can see every word through the Watch ESPN App. At the end of Round Three, we will announce no more than 50 spellers who will advance to the Thursday Finals. • Thursday, May 30 — Thursday finalists will spell onstage beginning at 10 a.m. They will continue spelling until we have about a dozen or so spellers remaining in the competition. This portion of the competition will be broadcast live on ESPN2. The dozen or so spellers will advance to the Finals on Thursday night, broadcast live on ESPN. Apply for media credentials in early May at spellingbee.com. Look for the media tab on the home page. • To obtain contact information and biographical information for the spellers you plan to cover — reach out directly to Valerie Miller. • During Bee Week, use spellingbee.com for round-by-round reports. • The Bee Week app will be available again beginning in early May. 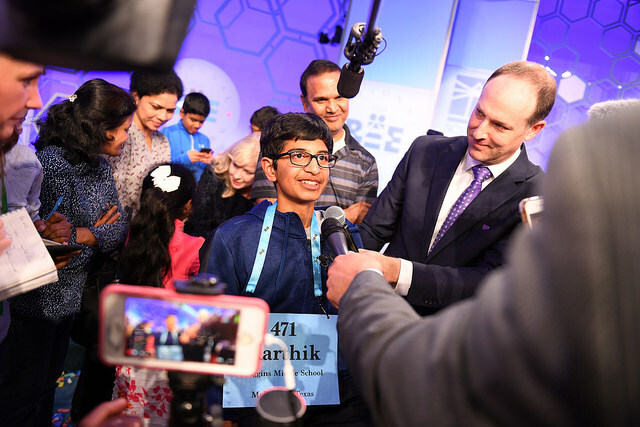 • The Bee posts thousands of photos on our Flickr page that you can use during Bee Week — give photo credit to: Mark Bowen/Scripps National Spelling Bee. • Media contact for the Bee is Valerie Miller — Valerie.Miller@scripps.com | 513-545-6474 — reach out directly to arrange pre- Bee Week or Bee Week interviews with Paige Kimble, Dr. Jacques Bailly, Mary Brooks, past Champions and eventual 2019 Champion. • For other Bee questions, please submit your request through our Contact Us feature on spellingbee.com.